The K&N 56-9159 fits some Audi 100, Opel Astra F, Opel Kadett D, Opel Kadett E, Vauxhall Astra Mk2, Vauxhall Astra Mk3, Vauxhall Cavalier MK2, Vauxhall Cavalier MK3, Vauxhall Nova, Volkswagen Golf I, Volkswagen Golf II, Volkswagen Jetta I, Volkswagen Jetta II, Volkswagen Jetta III, Volkswagen Passat, Volkswagen Polo, Volkswagen Santana, Volkswagen Scirocco, and Volkswagen Transporter T3 models. See vehicle applications for details. 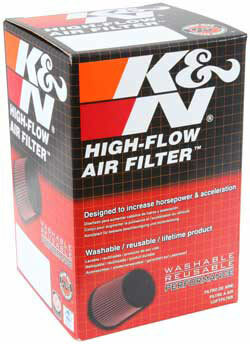 K&N Custom Air Filters for Single or Two Barrel Carburetors - K&N custom air filter kits are designed to boost performance from your carburetor while keeping the dirt on the outside where it belongs. These assemblies come with custom chrome top and base plates and the famous K&N High-Flow Washable Air Filter.